Home > Notre Dame Football > The New And Improved Brian Kelly – Has He Learned From Past Mistakes? 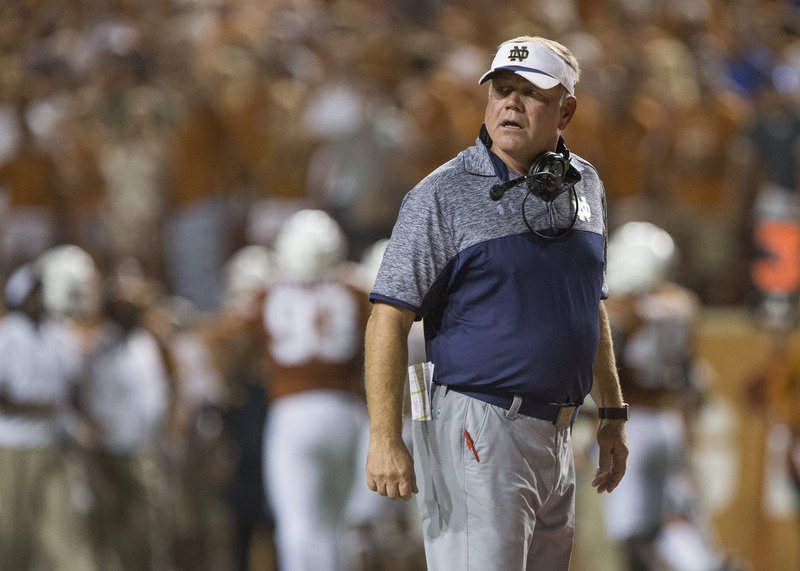 The New And Improved Brian Kelly – Has He Learned From Past Mistakes? Tuesday March 7th marked the annual Notre Dame football spring press conference. The flood gates opened and the tweets of beat writers flowed into our twitter feeds. For many of us, this press conference is an overdue needle feeding a Domer junkie’s vein. Many beat writers commented about Brian Kelly’s perceived change in demeanor – keyword “perceived.” Kelly spoke at length about the institutional changes and changes within his own personal responsibilities that have taken place since last year’s deflating debacle of a season. These changes, taken at face value, all appear to be positive steps in the right direction. However, this is said tongue in cheek with cautious speculation, because what national college football program doesn’t make considerable changes after an underachieving 4-8 season? More importantly, what are some of the changes taking place? The infamous “play calling committee” or the “three headed monster” that was allegedly running the offense last year is no more. The three people being Brian Kelly, Mike Denbrock, and Mike Sanford. Kelly is the only remaining coach from last year’s failed committee and Tuesday he made a concerted effort to explain that the offense will no longer be managed on a committee basis. Chip Long will be in charge of the offense – not just in title but also in day to day operations including game day play calling. Many among Irish nation have long called for Kelly to hand over the keys to the car and it appears that Long is positioned comfortably in the driver’s seat. To the skeptics, these comments will fall on deaf ears and any stagnation within the offense will be due to Kelly’s inability to stick to this plan. To the optimists, this change provides an air of much needed humility, and frees Kelly to become more of a CEO-type head coach where he can focus his individual efforts on all three phases of the game – rather than stubbornly micromanage the offense. Brian Kelly says the offense is Chip Long’s to run. Long will be the offensive coordinator in name and practice. Tempo a priority. Kelly had not previously been at 5:45 a.m. workouts. Made decision to do that this year based on 93 exit interviews with players. The staff, institutional, and personal changes that have taken place over the last 6 months are encouraging for Irish fans. However, the harsh reality is that – from an outsider’s perspective – all will have been for nothing unless these changes transmogrifies last year’s team into a championship caliber machine. Previous Post: « Considering Conference: Does Football Need It?